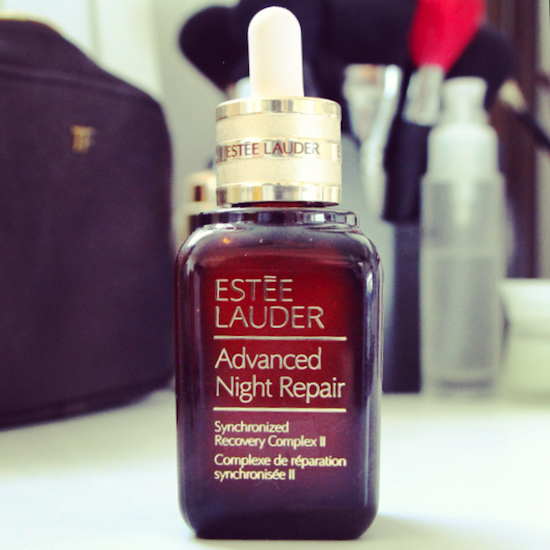 NEW Advanced Night Repair: Sleep in a Bottle – and it takes the Rubbish Out! So what’s in the Advanced Night Repair Synchronised Recovery Complex version two? Well, if you’re a fan of the original (and I know that loads of you are) then you can rest easy, because nothing has been taken away whatsoever. It’s still the all-rounder serum you know and love – instantly hydrating and helping to brighten and clarify the skin in the longer term. It’s light, non-greasy and slips easily into any beauty routine – not difficult to see why it has always been such a favourite. The new Synchronised Recovery Complex II, however, takes the serum onto a whole new level. The previous incarnation was very focused on repair; the new super-serum aims to repair and to purify. The original ANR contained a comprehensive cocktail of antioxidants that helped to fix the damage done to the skin during the day – think pollution, UV rays. (It also contained a whole whackload of hyaluronic acid for an instant moisture hit, so it plumped out the skin and reversed superficial lines caused by dehydration. All very good – and, I might add, very effective.) But the new serum, numero deux, adds something else into the mix: this “purify” business – or, to give it the proper Lauder name, Catabolysis Technology. Now the term Catabolysis does worry me slightly, I have to admit, because I instantly think of the state that the body goes into when it’s trying not to starve to death – not the most glamorous or desirable of associations! But in this case, we’re talking about the skin and the metabolism of cells – how fast the skin can renew itself and chuck out, for want of a better word, the crap. And so: let’s skip to my testing. I’ve done a month with the new formula, almost nightly, and I do think that the serum has an extra bit of “oomph” over the previous version. It’s slightly lighter in texture, silkier perhaps, and there’s no tackiness after application. Results also seem faster in coming – after just two weeks I felt that my skin was more supple and had a brightness that was lacking beforehand. The best way of explaining the results, because I have nothing very quantitive to measure, is to say that (cliché alert!) I look as though I’ve had good, restful sleep. Not fitful, hot, waking-up-every-hour kind of sleep. Can’t say better than that, really. Advanced Night Repair II launches nationwide on Monday 29th July and replaces the older formula. It costs £48 for 30ml and I’d say, judging by the amount I’ve used in a month, that a bottle would last for three or four months.You can get it here.